Offering an outdoor pool and spa centre, Begonia Hotel, Ilora is located in Ilora. The hotel has a year-round outdoor pool and barbecue, and guests can enjoy a drink at the bar. Each room at this hotel is air conditioned and comes with a TV. Rooms are equipped with a private bathroom equipped with a bath or shower. Begonia Hotel, Ilora features free WiFi throughout the property. 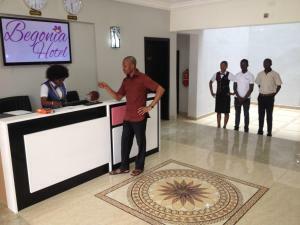 Queensway Resorts offers accommodation in Ibadan. Guests can enjoy the on-site restaurant. Free private parking is available on site. Certain units have a seating area where you can relax. Each room is fitted with a private bathroom. Queensway Resorts features free WiFi . A flat-screen TV with satellite channels is featured.